As some of you may know, last Sunday was International Mountain Day (IMD). 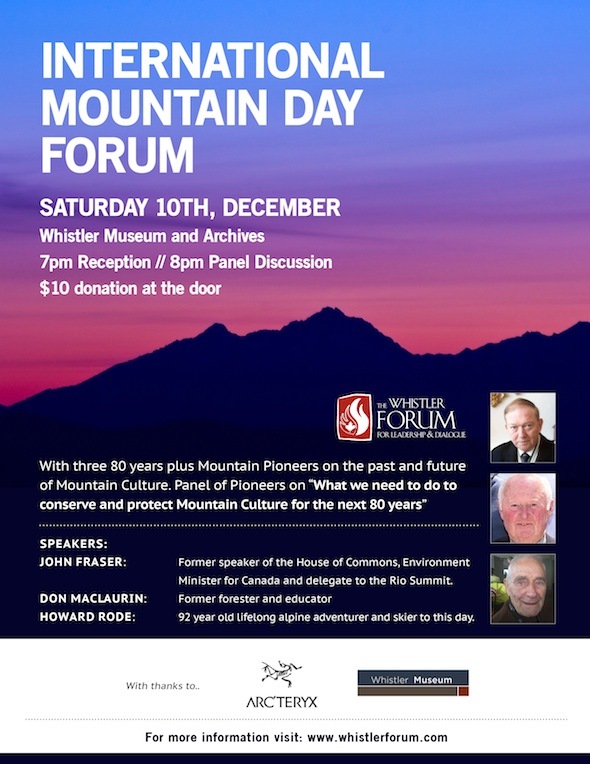 In recognition of this, and in conjunction with the Whistler Forum’s efforts to raise the profile of IMD in Whistler, a very special event was held at the Whistler Museum on Saturday Evening. Three elder statesmen of the mountains were invited to share stories from their lives in the mountains, and to communicate what the alpine realms meant to them. Our distinguished panel began with the 92-years-young Howard Rode, who has been climbing and skiing in our local mountains since he was a young man, and remains active today! His light-hearted recollections of early trips into Garibaldi Park recalled an era when far more effort was required of those seeking alpine adventures. Despite this, Howard spoke of his experiences with an undeniable fondness, clearly enriched from over seventy years playing in the mountains. Howard was followed by well-known local Don MacLaurin. Don, a retired forester, educator, and parks planner, was an active mountaineer for half a century, achieving multiple first ascents in the area and even acting as President of the British Columbia Mountaineering Club for some time. Don was no stranger either to physical exertion in the name of mountain play, but his talk focused on his lifelong efforts as an educator, and his desire to share the wonder of mountain environments with others. Our final speaker was the Honourable John Fraser, former Speaker of the House of Commons, Federal Environment Minister, and Canadian ambassador to many key international summits including the 1992 Rio Summit on Environment and Development. Mr. Fraser gave a fascinating talk on his early adventures growing up in a forestry family and running a pack train in the Yukon before settling into his professional career as a lawyer and politician. Perhaps the most interesting moment came when he described his involvement in a committee tasked with identifying potential winter Olympic sites in the 1960s. The distinguished legislator and statesmen concluded with several pointed suggestions for Whistler, which has been his part-time home for several decades, and more generally, for younger, environmentally minded citizens. It was a pleasure to be able to take part in this event, and it was truly an honour to host such a distinguished and impassioned panel. Whenever you have the opportunity to listen to anyone with this much experience and accomplishment, let alone three, you should take advantage. These three gentlemen had the great fortune (and foresight) to make the mountains a major part of their long, productive lives, and they made it quite clear that this was no coincidence. If I had to single out one lesson (among the many) to take away from the evening it has to be this : We live in a special town immersed in a truly inspiring and empowering natural landscape. No matter how busy you find yourself this winter, make sure you make the time to actually get up into the mountains and take advantage of all they have to offer. This entry was posted in Characters, Environment, News & Events, Pioneers, Recreation. Bookmark the permalink.